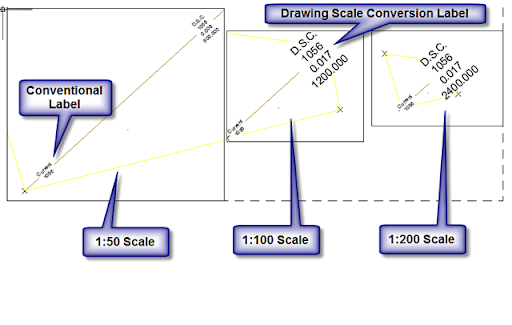 Here is an example of using the Drawing Conversion Scale in a contour label. I wrote about the new feature in Civil 3D 2009 originally here. For an English drawing the Drawing Conversion scale is the big number times 12. So in the example above the 600 scale relates to a 1"=50' scale. The 1100 is just below 1"=100' to capture any just below 1"=100'. The 0.1/12 represents what the text height is going to be (0.1"/12"/ft). Here is a picture of what the label looks like next to a conventional label. As you can see the conventional label stays the same size regardless of the scale and the D.S.C. label varies based on the scale of the viewport and the ranges we set in the expression. Note in my sample any scales below 1100, excluding 600, will have a text size of 0.5". Pretty nifty trick. i would love a copy of that style in metric format. That will save me a ton of time. Pretty nifty trick. i would love a copy of that style in metric format please. That will save me a ton of time. Let me see what I can do this weekend.